Billion Automotive, one of the largest auto dealer groups in the Midwest, needed to modernize their marketing efforts to include an increased digital and social media presence. Billion Automotive faced competing dealerships who were gaining viability in their markets. Our digital experts developed a multi-channel digital strategy across search, social media, and digital display campaigns for 24 dealerships representing 17 manufacturers. These efforts tied into offline branding campaigns to maximize awareness. 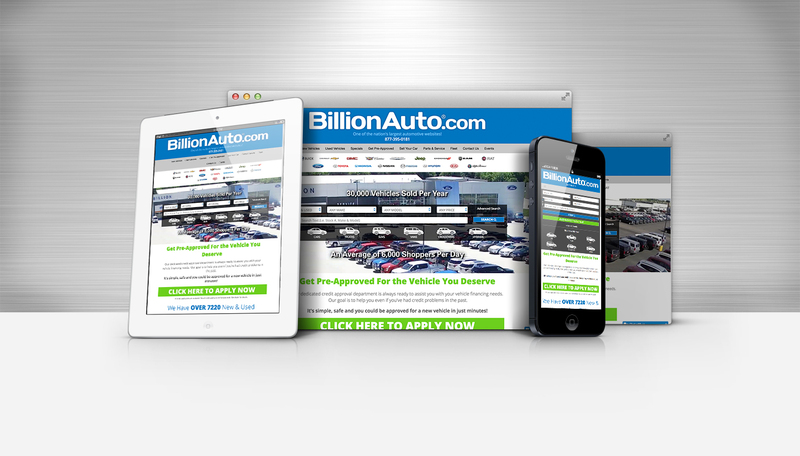 Sterling eMarketing also designed and developed a custom website that brought all Billion Automotive’s inventory together in one powerful site. As a result of our efforts, Billion Automotive reached and harnessed a significant amount of the desired market and has maintained brand recognition.